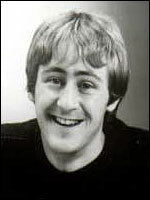 Nicholas Lyndhurst is one of British comedy's most recognised faces. In fact, from 1978 to 1999 no year passed without his appearing in a television sitcom, during which time he impressively made the transition from youthful comic sidekick to fully-fledged leading man. Born on 20 April 1961 in Emsworth, Hampshire, he attended the Corona Stage Academy . After appearing in adverts and a few small film roles, he made his television debut in Heidi (BBC, 1976). He quickly came to prominence playing the dual title roles in The Prince and the Pauper (BBC, 1976) and presenting the Saturday morning children's series Our Show (ITV, 1977), where he was billed as 'Nicky' Lyndhurst. He began his situation comedy career appearing as Ronnie Barker's awkward young son in Going Straight (BBC, 1978), the short-lived follow-up to Porridge (BBC, 1974-77). In Carla Lane's melancholy comedy Butterflies (BBC, 1978-83), he played another gangly youth, the extremely laid back son of Wendy Craig's neurotic housewife. By the time that series had ended its five-year run, Lyndhurst was already on his way to becoming a household figure as Rodney Trotter in John Sullivan's Only Fools and Horses (BBC, 1981-96). Through the series' long run, Lyndhurst's character was allowed to mature from a hapless teenage 'plonker' to a sensitive and confident husband and father, paving the way for Lyndhurst's emergence as a leading man in the romantic comedy The Two of Us (ITV, 1986-90), in which he stars as an IT expert who wants to marry his live-in girlfriend ( Janet Dibley ), while she wants to stay single. Lyndhurst is a lecturer (in computing again) in the spy spoof The Piglet Files (ITV, 1990-92), in which he is forced into a secretive double life after being recruited by MI5. This split focus strategy was also at the heart of writers Laurence Marks and Maurice Gran's Goodnight Sweetheart (BBC, 1993-99), Lyndhurst's greatest personal success. In it he plays Gary Sparrow, a TV repairman with a waning marriage who finds a portal to London in 1940. He begins a second life there, eventually marries his barmaid girlfriend (played initially by Dervla Kirwan and later by Elizabeth Carling ) and they start a new family, while he alternates between his new life in the past and his friends and family in the present. It was perhaps appropriate that in the concluding episode Sparrow opts to stay definitively in the past, reflecting the shift in audience tastes in the new millennium away from the traditional sitcom, of which Lyndhurst has proved to be such a mainstay, towards more edgy alternative comedy. Since then Lyndhurst s made few television appearances but was an impressive Uriah Heep in a two-part adaptation of Dickens' David Copperfield (ITV, tx. 25-26/12/1999) and there was another successful change of pace when he appeared in an episode of the dark anthology crime drama Murder in Mind (BBC, 2001-03) entitled 'Landlord' (tx. 11/5/2003). He has returned to comedy with the amiably traditional sitcom, After You've Gone (BBC, 2007). He is married to the former ballet dancer Lucy Smith.